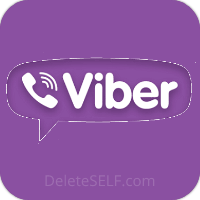 Viber is a free messenger application that allows you to connect with anyone in the world via internet connection. With Viber messenger, you can send and receive messages to work, group, friends and family. Like other messaging applications. Now let's look at Viber's difference. See what other features? Record voice messages and even send files. You may also "like" any user's voice or text message. As you can see, there are some features of interest. You can now delete your account if you are tired of using Viber or don't want to use it anymore. The deletion link and instructions are waiting for you below. You can delete your account immediately to create time for yourself. If you want to go back and use the app again then nobody will block you. Enjoy your time. and tap the "Deactivate Account"
This will remove your data from Viber! And deactivate Viber on your device.